From April 21st until May 21st, we will be enjoying Taurus Season 2019, a time of rest and relaxation after the Fiery and action orientated Aries Season. When the Sun shifts into this peace loving sign, we can feel more grounded collectively, and have a strong desire to set up comfortable routines for ourselves. This is a time where we can lay some firm foundations in place, a time of greater creativity, and of enjoying our homes and loved ones. Because the Sun is the centre of our Solar System, we tend to all feel it when this mighty planet shifts signs – and so no matter what our own, personal sign may be, this is a period where we can all tap into the practical, methodical and sensuous energy of Taurus. Our Taurus Horoscope for the month and for 2019 is a time of stability and routine, for getting into our bodies and out of our heads. Taurus embodies the Archetype of the “Builder” – there’s nothing Taurus likes more than to create solid, lasting structures patiently and carefully. This is not a time to rush anything, and we can benefit the most when we collectively go slowly. Taurus is also about the senses, so this is a time to really enjoy all 5 of them – dancing, eating, loving, shopping and good smells are all aphrodisiacs to Taurus. Keywords for this season include: creativity, sensuality, nature, comfort, routine, indulgence, laziness and nourishment. The mode of Taurus is Fixed – which means consistency, groundedness and stability. Taurus can be the most stubborn of all the signs, and so can be tough to deal with once they dig their heels in! However, the determination and patience of the Bull go a long way, and we can all tap into these qualities. The element of Taurus is of course Earth and so this is a period in which we can connect to the ground beneath our feet. It can a time of enjoying our senses more – eating well is something the Taurus excels at! We can luxuriate in the feeling of ocean water on our skin, try a new fragrance, or go to a lovely restaurant and enjoy delicious dining. Taurus is a creative sign, so exercising our creative skills can be very rewarding during Taurus Season 2019, as can dancing and feeling our bodies strength and flexibility, or perhaps even trying our hand at gardening, as Taurus so loves the earth. The ruling planet of Taurus is the Love and Relationship planet, Venus. Taurus is a charming sign, and loves being in love, being deeply romantic and enjoying the pleasure of indulging their senses with their loved ones. Whether you are single or in a committed relationship, this is a time period where you can flirt a little and make more time for love and pleasure. Venus also rules money, so we can spend a little during Taurus Season 2019 and enjoy some good shopping! Taureans are all about the senses – they are very physical beings and very in tune with their bodies and the environment around them. They love nothing more than the feel of a soft blanket, the smell of a good meal and the touch of their lover’s hands giving them a massage. Book yourself a day at the spa and don’t hold back! Buy some flowers for your home, and drink the smell in. Take some time to hold your lovers hand and go dancing with them. Really smell the delicious aromas all around you and maybe explore some new music to indulge your ears! Another lovely way to indulge yourself is by taking long, hot and bubbly baths – throw some flower petals in there and completely immerse yourself in the experience! Taurus is a profoundly creative sign. They love good art and are often talented musicians. Why not try and learn a new instrument, or do some painting or pottery classes? This will combine creativity with sensuality, two things that the Taurus is all about! Mosaic, jewelry making or dance classes may also be ways to express your creative energy over Taurus Season 2019. Taurus loves NOTHING more than their home, sweet home! They take enormous pride in a lovely home space, so this is the time to spruce up your living room, decorate the bathroom or buy some lovely new things for the bedroom. You can even make a few things yourself, letting that Taurus creativity be expressed! Taurus also adores just lying on the couch and watching Netflix. This is a month where you too, can curl up and watch your favourite series with zero guilt – make sure to have something yummy on hand, as the Taurus just adores their food together with a great movie! Taurus people are known food connoisseurs. They love a good meal, whether home cooked or chef made. Take a cooking course, or go out to eat at a lovely new place with your darling or friends. Fill your fridge with the yummiest snacks and feel free to graze whilst lying down and watching a good movie – this is heaven for the Taurus! Your creative energy can also be explored in the kitchen when you try out new recipes! Being an earth sign, Taureans really loves nature. 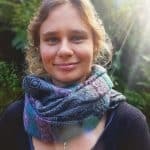 They don’t necessarily like hiking or using too much physical energy, so a picnic at the park will do just fine, combining their love of food, enjoyment of nature as well as just lazing in the Sun, which tantalises their keen senses. Go to a park nearby, a beach or a nature reserve, and soak in the beauty around you! Because taurus is ruled by Venus, planet of Love and Beauty, they love being in love and with their lover. Spend some time with the one you adore, and if there’s no one around, go out and explore – flirt a little! Taurus is a sign that is knowledgeable in all the fine arts of love, and so this is a time where you may feel attractive and very in touch with your sensual side. Offer your love a massage and really enjoy the sensual touch on your skin in return – take turns to indulge each other, to woo and romance each other. Going out for dinners or cooking for each other ticks the Taurus box of enjoying good food! Taurus loves a good shopping session. Although they are budget-conscious, they adore lovely, sensual clothing and good quality makeup. 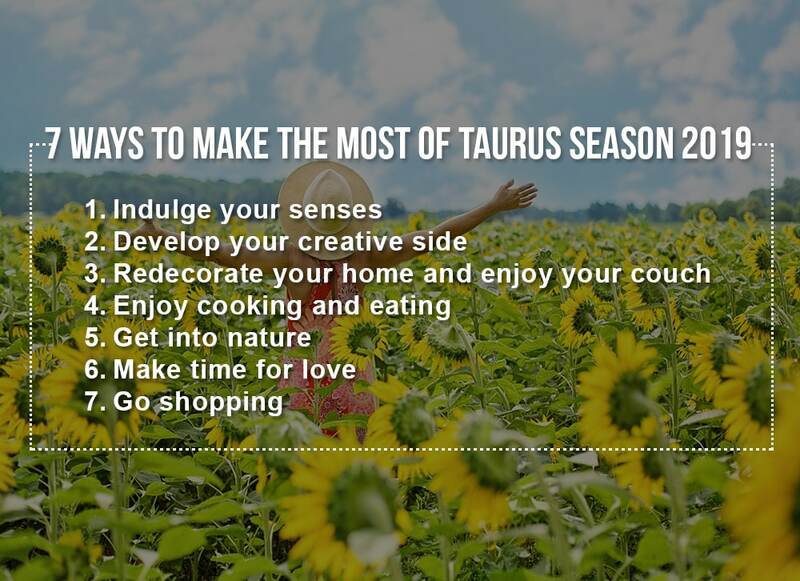 Go and spoil yourself a bit this Taurus Season 2019, and give yourself a makeover or a great new wardrobe. Then, hit the town with your partner or go on the prowl, looking and feeling gorgeous! 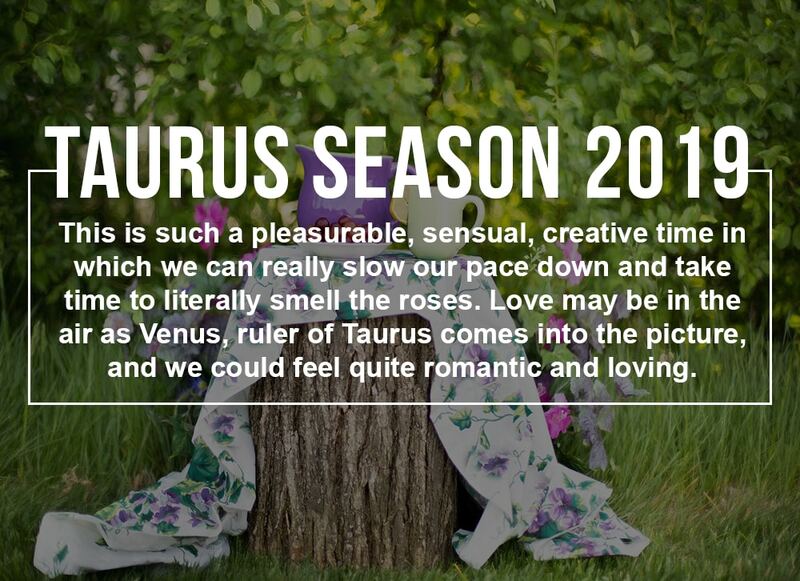 Taurus Season 2019 is such a pleasurable, sensual, creative time in which we can really slow our pace down and take time to literally smell the roses. Love may be in the air as Venus, ruler of Taurus comes into the picture, and we could feel quite romantic and loving. The Taurus Horoscope for 2019 is a lush period of learning to indulge ourselves, be a little lazy and to enjoy our homespace. Gardening, having picnics and dancing whilst we drink delicious drinks are all Taurus-ruled activities. This is a lazy time – not a period to rush anything or push. 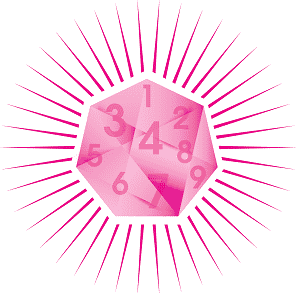 We may feel a little more ready to commit to things over this month and be able to work long and hard on our projects. 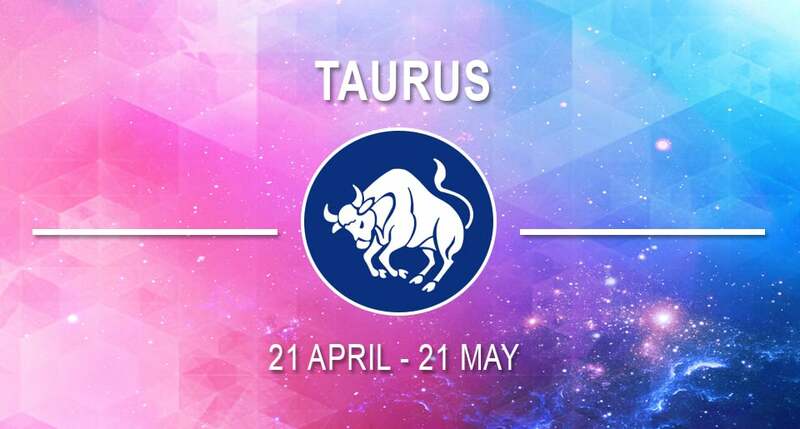 From April 21st until May 21st, we will be enjoying Taurus Season 2019, a time of rest and relaxation after the Fiery and action orientated Aries Season.